Summary: Warm rest of the work week ending in showers Friday through Friday night. Weekend temps 20 degrees colder, but dry and sunny. We continue with the unseasonably warm temperatures as we finish out the work week. Rain returns Friday. We will proceed through the rest of today with mostly cloudy skies and our high temperature reaching 70*. Winds will be out of the east today at 5mph, turning south later in the day. Overnight low temp will dip to 54* with winds out of the south. Thursday will be a repeat of Wednesday, with just a few degrees warmer thanks to the southern air pumping in. High will reach 73* as south winds increase t 5 to 10mph. Winds really pick up Thursday night with south winds at 10-15mph, with some gusts up to 20mph. Rain chances increase to 20% after noon, with our high temperature reaching 78*, ahead of a cold front that will knock 20* off of our highs for the weekend. Winds will still be gusty at 15mph southernly winds, gusts up to 30mph. Rain chances increase the closer we get to dusk to 60%. Some of these later afternoon showers could be strong enough to give us some lightning, but we are currently only outlooked for severe weather in the MARGINAL category, which is a 1 on a scale of 0 to 5. 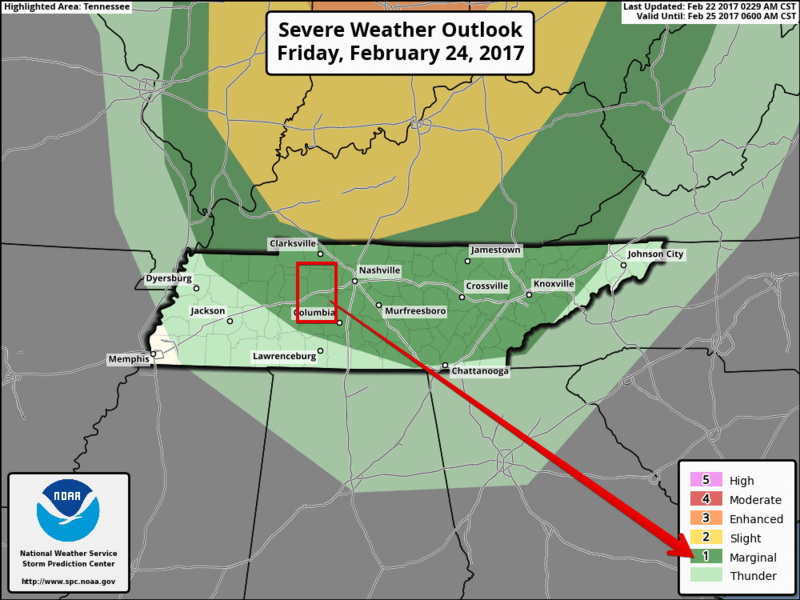 Most of the severe weather threat will be north of us Friday, but we will watch to see if this is extended southward. One thing we will be watching is the CAPE, or convective available potential energy (aka instability), that the approaching cold front will be able to pump into the midstate. We’ve learned that in the “winter” time in Tennessee (using “winter” loosely, as it still is technically winter even though it feels like late spring), we really only need about 1000 j/kg CAPE to see some type of storm activity and low-grade severe weather. The NAM4 currently has us at about 1500 j/kg around 3pm (21z) on Friday. CAPE isn’t the only severe weather making ingredient we look for. Without getting too nerdy, other elements for severe weather aren’t quite impressive enough right now to suggest the severe weather could be more in our area instead of north of us. The low pressure center will be pretty far north (currently modeled by weather models), and the other ingredients (like shear) aren’t that impressive. Regardless, the weather nerds are watching but there isn’t much there to get excited about. Rain chances taper off again after midnight to 20%. Overnight low will be 44* as the cold front moves through and drops temperatures thanks to the winds from the north. 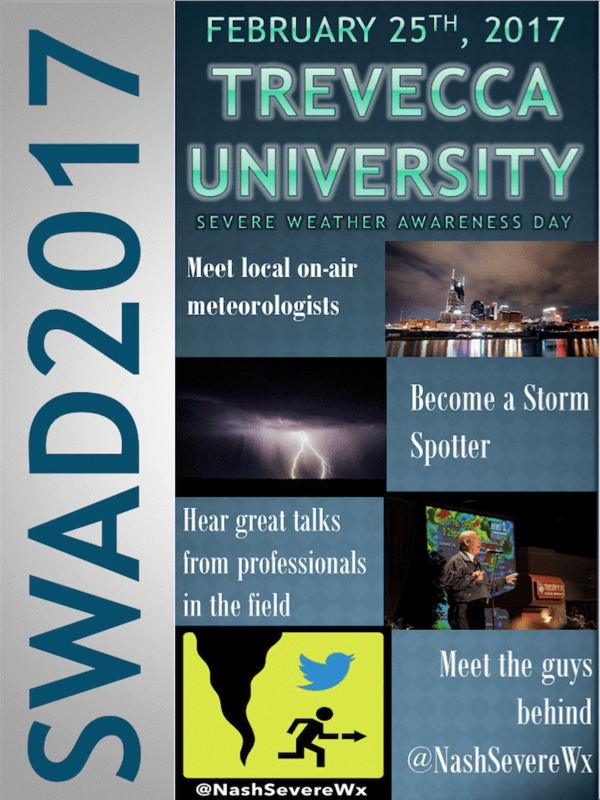 If you’re free and interested in the weather, I invite you to come out to Severe Weather Awareness Day at Trevecca University. 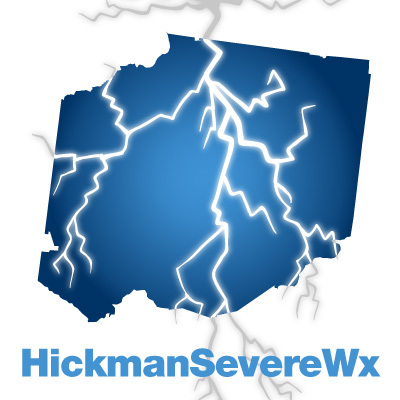 The event is free, but you must register here: weather.gov/ohx/swad2017. The event goes from 9am to 4pm. 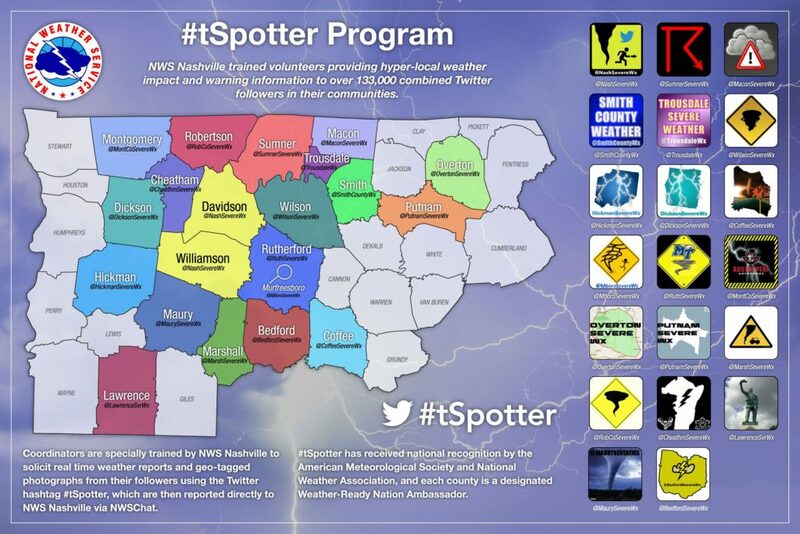 Come listen to local meteorologists, check out the booths, and meet myself and the other #tspotter coordinators!